Every October, Domestic Violence Awareness Month (DVAM) is observed to bring to light an issue that effects our community in a staggering way. 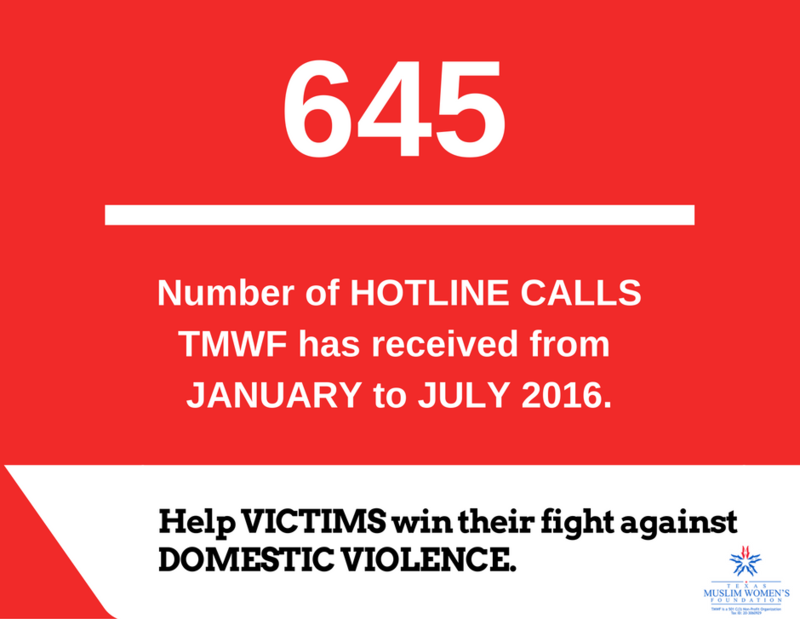 DVAM is an opportunity for domestic violence organizations like TMWF, to connect with the community through meaningful outreach and awareness raising events. Our “Peace in the Home” program has helped families to survive the trauma of abuse and achieve well-being, such as Uma and her family. Uma’s story below is just one instance where YOUR belief in our mission has made a life-changing difference. Uma*, a young woman, and her husband, and their 3 children came from East Africa to the U.S. as refugees. While living with her husband, Uma was abused physically, emotionally, and financially by her spouse and had no one to turn to. Her friends were afraid to help her; her community was unable to understand what she was going through and asked her to be more understanding of her spouse to keep the family together. Because of her community, Uma never called the police. Read more. #TakeaStand. Together we can stop this epidemic. Talk about domestic violence and help us fight the cycle of abuse! Victims of domestic violence like Uma live in constant fear. They feel the abuse is their fault and often times try to either minimize, or take responsibility for the abuser’s behavior. For victims of domestic violence home becomes a walk in a field of land mines – a place of constant terror. Domestic violence at home also robs children of their childhood! Children are impacted by abuse sometimes even more than the victim. A child does not need to be directly abused or witness abuse to suffer its consequences; if abuse happens in the home, they know and are impacted for life. More. YOUR contributions make it possible for us to provide 24-hour emergency shelter, 24-hour hotline, case management, legal representation as well as counseling for the victims and their children. Everyone has a role to play in building a safer Texas. There are many ways you can show your support for family violence victims and survivors, and help create communities free from violence (tcfv.org). Thank you for your generous donation to Texas Muslim Women’s Foundation on North Texas Giving Day 2016. The results are in! We are humbled and honored by your continued support to fulfill our mission to empower, promote and support all women and their families. TMWF uses your valuable contributions in the most effective way possible to bring renewed hope for the community’s most vulnerable members; promise of a brighter future for our youth; and education to build a stronger community. YOUR gift makes YOU a true #PeaceChampion. Your commitment to TMWF means the world to us and on behalf of our Board of Directors, staff, clients and community, we thank you for your generosity. Note: We invite you to contact your employer to learn more about taking advantage of corporate matches. These programs are excellent ways to make your contribution go further for TMWF. In contemplating the coming month’s events, I am deeply moved by their tremendous significance, locally, nationally, and internationally. September is an extremely busy month for TMWF, as you will see in this newsletter. Please join us for the wonderful programs, events, and presentations, which you will find extremely informative and relevant to ensuring a society of compassion, care, and positive social change. I. September 5, 2016, Labor Day was a celebration of all the workers who contribute their expertise and knowledge to help society function smoothly. II. September 11, 2016, is the remembrance of the tragic events of 9-11-2001, which changed history for us here as well as the whole world. We make sincere prayers for the families of the victims and all people in the world to live together in peace, harmony, and good will. III. This year September 11, 2016, coincides with The Day of Arafah on the Islamic lunar calendar. The Day of Arafah is the final day of the annual Muslim Pilgrimage to Mecca, the Hajj. September 12, 2016 coincides with the celebration that culminates the ending of the Hajj, called Eid al Adha, known as the Festival of Sacrifice (celebrated for four days). These holy days will be observed by about three million pilgrims while they fulfill the fifth obligatory Tenant of Islam, the Hajj, as well as the rest of the 1.6 billion Muslims all over the world. During this major observance, Muslims are paying tribute and enacting the story of Abraham-the patriarch of prophets and messengers for Jews, Christians, and Muslims-therefore emphasizing that the essence of these three major world religions is the same. I cannot help noting that the Day of Arafah this year is falling on September 11. Three million pilgrims will gather on the small hilltop called Arafah (Arabic for “to recognize”) in Mecca, where tradition claims that this is where Adam reunited with Eve after they descended from Heaven! It is such a sobering reminder that all of humanity are children of one couple, and all are brothers and sisters and cousins of one another, with common bonds uniting them together, irrespective of their different faiths, denominations, genders, ages, languages, customs, and economic statuses. While the Muslim pilgrims are on Mount Arafah (September 11, 2016), dressed in the simplest of outfits, they are indistinguishable from one another in their observance of the ritual. They all are actually rehearsing how all of humanity will be resurrected on the Day of Judgement, and will be standing before the ultimate and just Creator, with only their deeds and actions to speak for them! As a Muslim, I feel that we are sending a message to our brothers and sisters in humanity, that should also be the most eloquent response to Islamophobes and hate-mongers, who are trying to separate God’s creation into ‘them’ and ‘us’, and turning races and faiths against one another: On this September 11, 2016, all Muslims worldwide will stand together as one compassionate caring human community, exchanging good wishes of peace together, and donating generously to feed and help those less fortunate, while following the example of Abraham-the father of all the monotheistic messengers-unified in their humanity and humility. “Eid Mubarak” to all our Muslim brothers and sisters here in North Texas and to the 1.6 billion Muslims worldwide for the great celebration of Eid-ul-Adha-the major Feast of Sacrifice. IV. 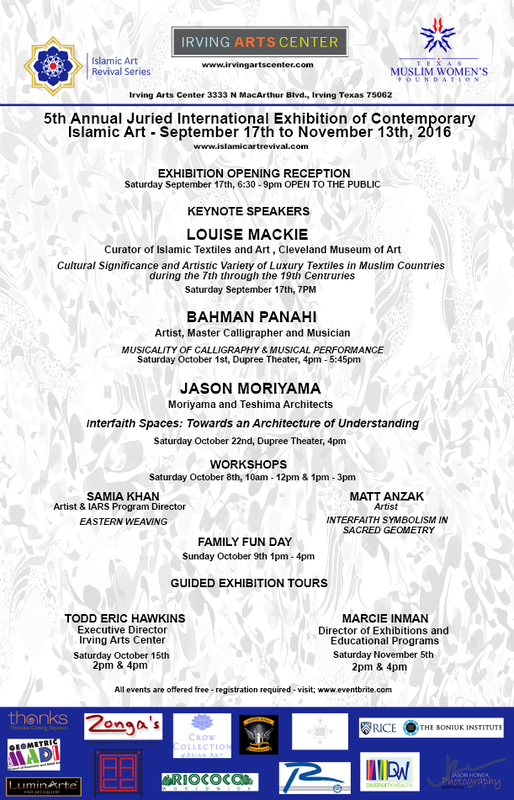 September 17, 2016, is the official opening of the Islamic Art Revival Series 5th Annual International Juried Exhibition at the Irving Arts Center. This event also highlights our shared humanity as it uses the universal language of art to communicate to all world cultures. Artists from different countries will present their talent and show the expansive influence of Islamic art on a large range of cultures resulting in a unique as well as inclusive whole. V. September 22, 2016, North Texas Giving Day is another great day witnessing the bond among ALL people in support of charities benefitting different causes and needs. In fact, it is a miniature replication of Muslim giving during Eid-ul-Adha! Last year North Texas Giving Day raised $33 million through more than 118,000 gifts benefiting 2,020 nonprofits. Can you imagine what 1.6 billion Muslims giving on any Eid can amount to and how many people can benefit? VI. September 24, 2016, is Muslim Day of Dignity where all Muslim charities come together to feed the homeless in South Dallas, and when TMWF will be sponsoring a workshop on “Establishing Peaceful Families” at EPIC Mosque in Plano. My dear TMWF friends, members, staff, donors, I am inviting you all to join us at the upcoming celebrations, remembrances, and charitable giving to spread good will and compassion among all our brothers and sisters in North Texas. I’m also asking for your sincere and heartfelt prayers for our loved ones experiencing very serious challenges to their health and emotional, economic, and physical well-being. May God bestow infinite blessings of healing and stability in their lives! 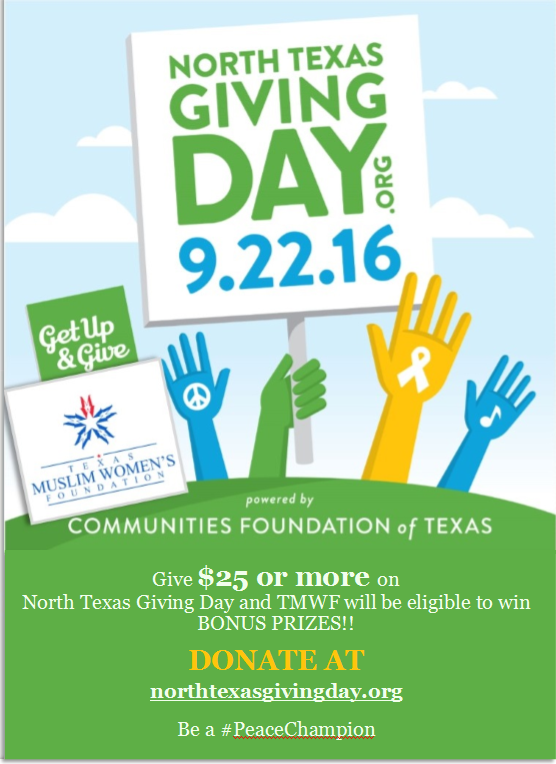 Texas Muslim Women’sndation is excited to participate once again in North Texas Giving Day! Why should you give on North Texas Giving Day? Champion our Social Services Program, you are helping the helpless out of a difficult situation and giving them strength so that victims can become survivors. Support our Youth Leadership Program, you are making the youth feel heard and embraced and letting them know that they have a critical role in society. Sponsor our Islamic Arts Revival Series program, you demonstrate the inclusiveness and diversity of our community here in North Texas, and emphasize the wealth of cultures and heritage that connects us all. Participate in our Interfaith Outreach Program, you are advocate for the shared concerns of humanity and work across differences in faith for the common good. We encourage you to give generously to TMWF and other charities of your choice on North Texas Giving Day. Donations that range between $25 to $50,000 will be multiplied by $2.5 million in bonus funds and prizes, which increases the value of the donation! By giving during North Texas Giving Day, you show the care and compassion of the Muslim community. Mark your calendars and be part of the excitement and incredible generosity! TMWF provides free, comprehensive, trauma Informed and culturally sensitive services: case management, counseling, play therapy for children, legal representation in immigration and family law, and financial empowerment, specially for victims of domestic violence, regardless of faith, ethnic background and race. HELP IS AVAILABLE!! Please reach out for help if you or someone you know needs help. Call our 24 hour hotline at 972-880-4192. With the rise of the Zika Virus outbreak, the Texas Department of State Health Services (DSHS) is sharing information to help prevent the spread of the Zika Virus in Texas. The Texas Health and Human Services Commission (HHSC) issued a press release confirming that Healthy Texas Women and Texas Medicaid will cover the cost of mosquito repellent for women who are between the ages of 10 and 45 or pregnant. DSHS has developed materials, including a digital information toolkit with newsletter copy, flyers/fact sheets, posters, social media content and PSA’s for organizations to share with their constituents and employees. These resources offer information regarding simple but important steps Texans can take to help prevent the spread of the Zika virus. The materials are free and available to download or available to order online through this link: http://www.texaszika.org. Thanks to MAS Dallas Girl Scouts Troup 2420 for the hygiene kits for our clients! Your contribution helps us meet the needs of the many we serve! September 17 – Opening Public Reception of The Islamic Arts Revival Series (IARS) International Juried Art Exhibition at the Irving Arts CenterBring family and friends to celebrate and learn from this unique international exhibit of art, workshops, and performances of Islamic art and its world-wide influences. Register today for all the upcoming events! Click here for gallery hours.Visit www.islamicartrevival.com or Irving Arts Center for more information. 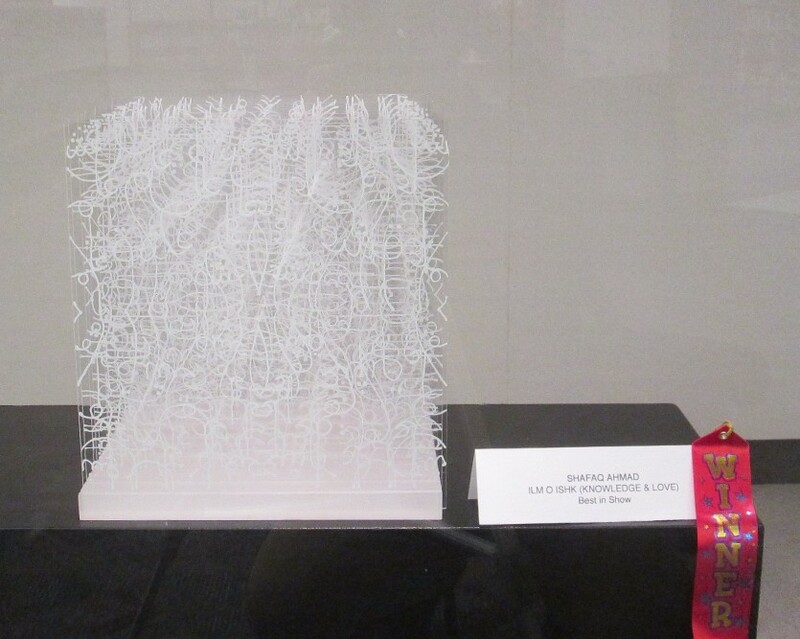 We are proud to announce that artwork created by our own Islamic Art Revival Series Curator, Shafaq Ahmad, “Ilm o Ishk” (Knowledge and Love), sculpture of plexi-glass, won best work in the juried art exhibit of the Dallas Public Library. Additionally, Ms. Ahmad will exhibit her installation in the main gallery at the Irving Art Center during the IARS 5th Annual International Juried Art Exhibition. On October 22, after the Jason Moriyama lecture, she will have a brief collaborative presentation and performance with the Ismaili Muslim Youth Choir of Dallas. North Texas is receiving a large number of Syrian families who will need our community’s support. This workshop co-sponsored by TMWF and the Islamic Circle of North America (ICNA) provides insight on the needs of new refugees joining our community. Please consider contacting TMWF, not just to give short-term support of food or clothing, but for long-term support such as adopting a family, mentoring youth, or teaching English as a Second Language. For more information and registration email tmwf@tmwf.org. This month’s TMWF Monthly Ladies Only Luncheon celebrates the various cultures that make up our community. We invite you to wear your cultural ethnic attire and come prepared to mingle with a diverse group of ladies from around the globe who call Texas home. Enjoy the delicious food of Zonga’s Mediterranean Grill. We’d like to thank Zonga’s owner, Bassem Odeh, for kindly hosting us at his restaurant. Seats limited/First come first served. For more information and reservations please contact us at tmwf@tmwf.org or call 469.467.6241. To join the mailing list to receive notification of upcoming “Ladies Only” Monthly Luncheons Contact us at tmwf@tmwf.org. Please join TMWF and EPIC Community in learning about the elements necessary for establishing peaceful families and addressing the scourge of domestic violence that disrupts the sanctity of our homes. Please join TMWF’s Executive Director, Dr. Hind Jarrah, as she presents ways to establish peaceful families through safe conversations. Hope everyone has had an amazing summer! Here are some of our upcoming events for this fall. On September 24, we will be volunteering at Day of Dignity to help provide hygiene kits, clothes, household items, health screenings, and fruit to the underprivileged in Dallas. The address is Martin Luther King Center on MLK Boulevard, Dallas, TX 75215. We will announce the time soon. Also, TMWF will be collecting fruit to distribute on the Day of Dignity, so please email youth@tmwf.org to sign up to donate fruit. It will be greatly appreciated by the recipients! On October 8, we will be volunteering at the White Rock Lake Cleanup. Location is White Rock Lake, Dallas, TX and the time will be announced soon. We will be picking up trash around White Rock Lake in Dallas. Volunteers will be provided with disposable raincoats (depending on the weather forecast), trash bags, tools to pick up trash, as well as hot coffee, water, and breakfast (fruit, granola bars, cookies, donuts, etc.). This is a great opportunity to easily gain volunteer hours while also enjoying fresh air and the beauty of the lake. On November 19, we will volunteer at the Plano Community Garden from 9:00 am to 12:00 pm. Location is 4030 W Plano Pkwy, Plano, TX 75093. Tasks vary each month but they always need help with weeding, mulching, pruning and turning the compost piles. They provide adult gardening gloves and tools but volunteers may bring their own. Since no gardening experience is necessary, even non-gardeners can join in the fun. Please be aware that parking in the gardens is limited so carpooling is encouraged, whenever possible. Only 10 volunteer spots are available. Email us to RSVP your spot! All volunteers can earn volunteer hours for their service. To sign up for these events, please respond email youth@tmwf.org. Stay up to date with future fall TMWF Youth volunteer activities by visiting our Facebook page! Texas Muslim Women’s Foundation continues building bridges of understanding and goodwill among peoples of all faiths and races. There are many upcoming opportunities for you to meet your neighbors and make new friends. Please join us for these events. We continue our interfaith outreach, via our membership in the The 2nd Community – a multi-faith community program formed to share faith stories “freely and fearlessly” and hosted by Northaven United Methodist Church. The 2nd Community events serve to facilitate a respectful understanding of the beliefs and practices of others and, in so doing, enriching one’s own faith perspective. Texas Muslim Women’s Foundation was recently selected by the Liberty Mutual Foundation and United Way of Metropolitan Dallas to receive grant funding in support of our efforts to provide aid for some of the most vulnerable members of our community. Often, our clients come to us in fear with nothing more than a few personal belongings. We provide shelter, food, clothing, counseling, and support that address not only urgent needs but also compassion to help our clients get back on their feet and on the path to healthy productive lives. Thanks to the support of those like Liberty Mutual and the United Way of Metropolitan Dallas, we are able to provide a safe haven and support for families who are struggling due to domestic violence.